LOS ANGELES (AP) — Father Jim Sichko has a 50-state congregation and a simple mandate from the pope: Go forth and do good deeds. That’s why the Roman Catholic priest found himself standing by the drive-thru of a popular Hollywood fast-food joint on a recent windy, rain-swept afternoon buying lunch for everyone who stopped by. The next day he’d be at a gas station in Kentucky, topping off people’s tanks. Then it would be on to Arizona where he would — well, he wasn’t quite sure what he’d do there, but he’d think of something. At a Starbucks last Christmas, he tipped each of the baristas $100 after learning the annual brouhaha over whether the coffee chain’s holiday cups are Christmassy enough had caused tips to plummet. Sichko is a papal missionary of mercy, a rarified group of 700 from around the world, including 100 from the United States, who were appointed directly by Pope Francis in celebration of a “Jubilee of Mercy” that began in December 2015 and has since been extended indefinitely. Sichko, a Kentucky-based preacher, came up with an idea different from the others and got his bishop at the Diocese of Lexington to sign off on it: He’d travel his country performing random acts of kindness in all 50 states. He’s provided groceries for half a year to a man with HIV and paid for medical services for a struggling Muslim family. This Christmas, he’s headed to an elementary school in Corbin, Kentucky, where more than a quarter of the population lives in poverty. There he’ll surprise the school’s 100 second-graders with shiny new bicycles. “The first question people ask is, ‘Why are you doing this?‘” Sichko says between bites of his double-double cheeseburger at the crowded In N’ Out restaurant down the street from the Hollywood Walk of Fame where he’d just bought lunch for everybody. “My question,” the balding, bespectacled 51-year-old cleric adds with a smile, “is why not? “We have a lot of atonement to be doing,” he says, adding that shocking people with random acts of kindness can be a first step in that direction. To say he shocked his lunchtime In N’ Out crowd would be a bit of an understatement. “No, I’m not a politician. I’m a priest,” he replied, nearly doubling over with laughter. “How did this happen,” a stunned Hardy Patel asked. “I will do, I will do,” Patel told him before driving off with his cheeseburger, then circling back to thank Sichko and take a selfie with him. “Here’s my selfie with the pope,” Sichko told Luis Tostado a few minutes earlier as they posed for one by Tostado’s Chevy Silverado. Sichko’s selfie shows him standing next to Francis as the pontiff cradles a bottle of 23-year-old Pappy Van Winkle Kentucky bourbon the priest gave him during a visit to the Vatican. He isn’t sure if the pope is a bourbon man, but if not, the smile on Francis’ face indicates he does have a sense of humor. Sichko says he still doesn’t know why the pontiff, who had never met him until 2015, chose him as a papal missionary of mercy. Ordained 20 years ago — “I always wanted to become a priest, ever since I was a little kid” — he was the pastor at St. Mark Catholic Church in Richmond, Kentucky, when he got the call. 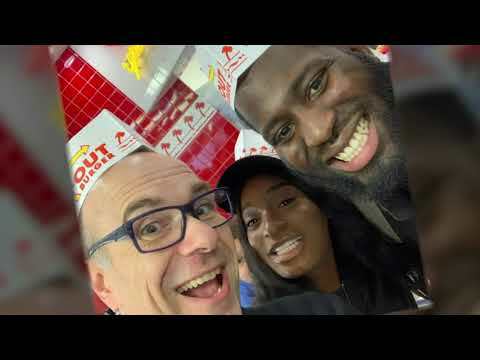 Now he spends five days a week on the road paying for burgers and bicycles and handing out hundred-dollar bills, like the one he slipped 17-year-old Nicholas Vadi when he learned the teenager and his mom were celebrating Vadi’s birthday at the fast-food restaurant. “I raise my own salary, living expense, insurance, everything,” Sichko says, adding he sends out “appeal letters” twice a year to parishioners and raises the rest from paid inspirational speaking engagements. “And then I give it away,” he says, laughing. Recently he’s started marketing “Miss Marie’s All Natural Spaghetti Sauce” online and hopes to get it into stores shortly. But even the money from that goes to help others. It’s divided among a Texas hospice that cared for his late mother, for which the sauce is named, and a church program to benefit the poor in Appalachia. It was his mother and her sauce, Sichko says, that likely ingrained in him the desire to help others. Every Tuesday she’d whip up a batch and serve it over pasta for lunch to the hungry garbage collectors who worked the route in their neighborhood. Now he’s using it to keep her memory alive and to help spread the Gospel to Catholics and non-Catholics alike.